There’s nothing quite like camping for getting you close to nature and ensuring that you have a good time out in the wild. You get to enjoy the environment and make the most of your surroundings. It’s a fun family activity and a cheap vacation. Unfortunately it’s also pretty darned uncomfortable! Especially if you’re laying right on the ground in a tent. That’s why it makes sense to invest in a good quality cot for camping. I spent years roughing on the floor of a tent in a sleeping bag. Then I upgraded to laying on an air mattress, and finally I got myself a good sturdy cot. The cot was a game changer! I actually began looking forward to sleeping when night time rolled around while camping. Unfortunately my first cot wore out after one season of use and I had to purchase another, lower quality product. Since then I’ve gone through more than a dozen different cots, and slept on the cots of many friends and relatives to try to pick out the right option for me. After all that work and testing I feel qualified to recommend cots to friends, and hopefully this guide will help you choose a decent cot as well. Comfort – The most important feature that you want from a camping cot is comfort. It should support your back nicely, while offering enhanced comfort compared to laying down on the ground. Durability – After comfort comes durability in importance. The cot should hold up to regular use and hold your weight without issue. It should be made from corrosion-resistant materials so that you can confidently use it in most camping environments. 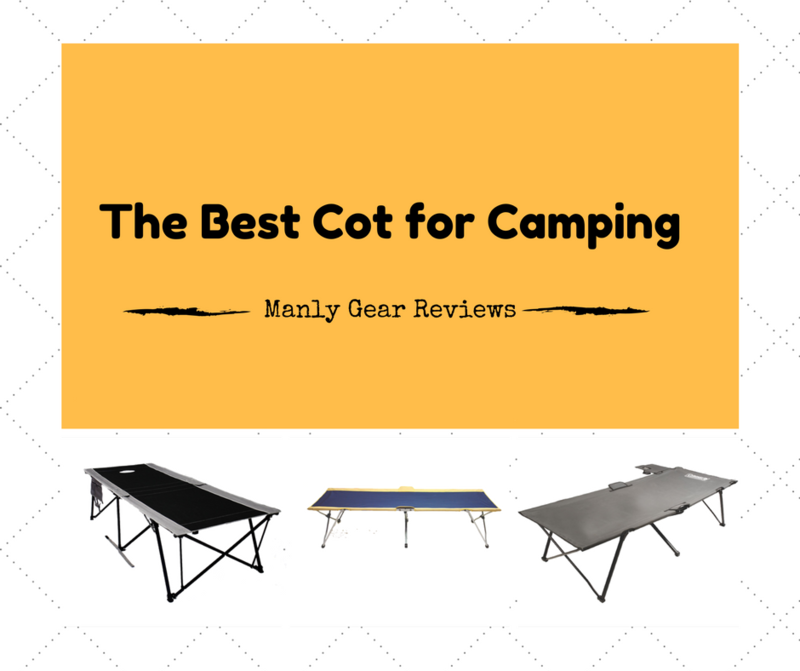 Ease of Use – Some cots are a pain in the behind to put together and start using. If it takes you more than 5 minutes to put together and lay on it’s probably not a good option. Space – Without enough space a cot isn’t very comfortable to sleep on. That’s why it’s important to make sure it’s roomy enough for you to lay comfortably. Lightweight – This is a bit more important when camping a decent walk from the car, but it’s important that the cot isn’t too heavy or it could be difficult to position and set up. The Coleman Pack Away cot is quick and convenient to setup and a good companion for general camping outings. It’s really durable and holds up to 300 lbs. during use. The cot packs down into a compact footprint that’s simple to store, and you can slip it into a trunk, a tall camping pack or anywhere else that you want to put it. The cot is around 20 lbs. and is very easy to comfortable. 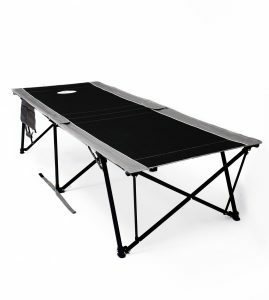 It sets up in moments and can be put away in the same period of time, making a good solution when you don’t want to spend much time messing with beds. 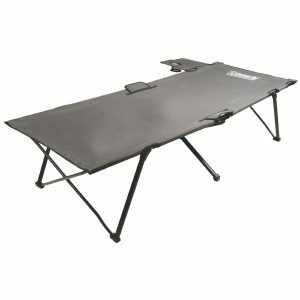 This camp cot from ALPS Mountaineering is a good piece of equipment for campers that want ample space. It’s exceptional tall with an 82” length and there is plenty of room to sleep with 32” of width. It comes with a convenient little storage bag hanging from the front, and the cot itself sets up in less than a couple minutes and folds up just as quickly. It supports 325 lbs. and felt very sturdy the entire time I used it. The only minor gripe is that it wobbles a bit more than other cots, so it might not be the best for serious movers. 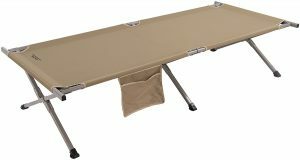 The Kamp Rite FC421 Oversize Kwik cot is one of the most durable of the bunch and it holds up to 400 lbs. It’s really sturdy and doesn’t come with the annoying bars on the ends to deal with like many cots do. Even without the bars the cot is exceptionally stiff and offers impressive support. It sets up in less than a minute once you know the process, and folds up and into its carry sack even faster. At just 25 lbs. the cot is comfortable to carry. It also has a little pocket to hold cell phones, keys and other small objects. The Kamp Rite FC321 double cot is a good solution for couples looking to sleep next to one another on a camping trip. It can support up to a total of 550 lbs. and offers space comparable to a queen size bed. It does come with a support bar down the middle, but when paired with an air mattress the bar isn’t noticeable any longer. It folds down into a compact footprint and weighs just 32 lbs. making it one of the lightest options for two sleepers that you’ll find. Out of every cot, the Easy Portable Folding Byer Maine cot is the easiest to set up. It goes up in less than a minute and can be taken down just as quickly. Pluck it out of the bag and pull it apart and it’s done. You’ll be amazed at how fast you can begin sleeping. This large cot holds up to 325 lbs. It’s large enough for a single person to sleep comfortably, even a larger person, and it weighs just 24 lbs. when packed up in the included carry sack. 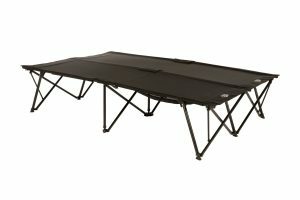 It comes with durable steel legs and feels very sturdy when you’re sleeping on it. There isn’t much wiggle or sag during use, which is nice.